I was on the hunt for what was originally the first journey of 2018! A ticket to travel to Kochi towards the end of February - and I was still in the first week of January 2018. Almost every airline offered tickets at Sale prices. My favorite OTA listed Go Air as the cheapest. 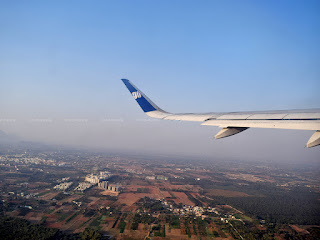 Go Air is a new entrant on the Bengaluru-Kochi Sector, a re-entry rather. I opted to book the ticket on the Go Air website instead - the website was clumsy, and the progress through the booking was slow. I finally booked my first ever ticket on Go Air for the Kochi sector - I added a meal - 'Veg Smart Snack' and opted for a 'free' seat as well. I generally stay away from family functions - but, for some reason decided to attend a cousin's marriage in Palakkad. The initial plan was to accompany my family the previous day, but certain circumstances forced me to rethink, since traveling with them would need me take a day off. I decided to travel later in the day, so that I can save a leave, and also travel by bus! 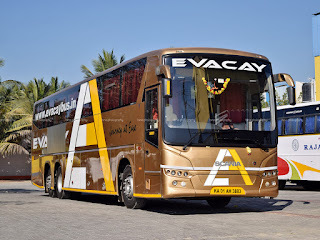 I badly wanted to try the new sensation on the route - Evacay Travels! I did not put in a lot of thought before booking - Evacay was the most expensive among the lot - SRS, Conti, KPN, MSS all offered cheaper rates - but the decision was already made. This was the first journey of 2018, and it had to have something new - a new operator was the best choice, IMO. My ticket was booked through RedBus (for no particular reason) - and the mTicket popped up on WhatsApp in no time!